Quite occasionally, Novi apartmani likes to analyse its business performance, all with a view to ensuring the simple, high-quality and affordable enjoyment in Belgrade charms. We in Novi Apartmani just love, quite occasionally, to draw the line and analyse the occupancy rates of our accommodation capacities and identify the apartment which records highest interest, all with a view to improving our offer of apartments and the accommodation capacities, not only in Novi Apartmani, but in our beloved Belgrade as well. This time, we’re talking about apartments with jacuzzi bathtub, the category which records more and more interest among both the local and international tourists. That’s why we’ve decided to identify 5 apartments from this category which were immensely popular during the first half of 2018. Domino 2 is an apartment predestined to overcome the last year’s winner in terms of the number of overnight stays – its name twin – the apartment Domino. With a very nice location which allows great connection with all parts of Belgrade and the airport, and the vicinity to the business and administrative hot spot of our capital, this apartment is more than a smart choice for all business people. On the other hand, two rooms which can accommodate up to 4 persons, a jacuzzi bathtub for two and infrared sauna made from Nordic spruce offering its unique fragrance, will provide a fantastic experience for all its guests and make this apartment highly popular among all the guests looking for complete relaxation, surrounded by ultimate spa centre only for themselves. Apartment Akvarijum is located right next to Cvetni trg area, and is a genuine mini spa centre with sauna and a spacious hydro-massage bath. What really makes this apartment stand out from the rest, and at the same time the feature it was named after is the fantastic aquarium which makes this apartment really authentic. In the immediate vicinity is the Beogradjanka building, Student Cultural Centre, Manjez park, Belgrade Drama Theatre, Kralja Aleksandra Boulevard and Tasmajdan part, so the location is extremely popular among the local and international guests. The aquarium inside the apartment is huge and covers an entire wall, all of which contributes to the unique atmosphere. The guests arriving by car have the opportunity to book the parking spot during the stay, which is an added value of this apartment. Apartman Atlas 2 is located in Vozdovac, the Belgrade municipality which is very near and well-connected to the main central municipalities. The apartment is indeed luxuriously equipped and modern, and the interior offers a spacious hydro-massage bathtub, which, surrounded by a stone wall, provides a feeling of being inside an intimate, hidden cave. Atlas 2 is a studio apartment intended to accommodate two adults who, if arriving by car, will have a secured parking spot. An interesting feature of this apartment is the possibility of 24-hour check in, which comes rare in the offer of Belgrade apartments. Apartment Afrodita in Dusanovac area is, although not in the city centre, an ideal choice for all those looking for a good connection with the high-way, and with only a couple of bus stops and 10 minutes of driving, you’ll be in the heart of Belgrade. Afrodita is a highly comfortable and well-equipped apartment and in addition to high-quality furnishings, the guests will be able to enjoy the spacious hydro-massage bathtub, ideal for two. 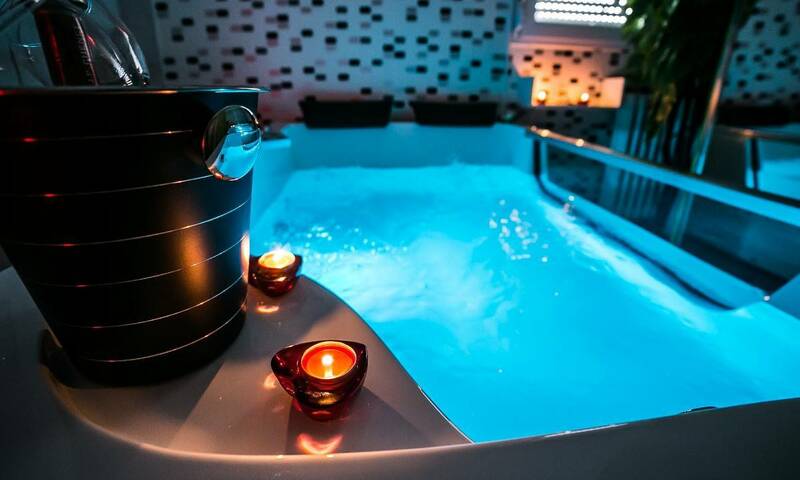 The maximum capacity of the apartment is four and Afrodita is one of the biggest apartments with the jacuzzi bathtub in the offer of Novi Apartmani. The apartment has no parking space provided, however, the location is not covered by parking zone, so you’ll easily find a parking spot outside, in the street. Apartment Aqua is located in New Belgrade, in Milutina Milankovica Boulevard, the former Treci Boulevard. Nearby you can find Coffee Dream, Gorenje store, Hyundai car saloon, Auto Cacak dealership and not far away is Belgrade Market, and a bit further down the road is Delta City Shopping Mall, Airport City corporate centre, Belville residential area and A Blok and Savada building blocks. Medi Group hospital is also near. This is the apartment with a jacuzzi bathtub for two, and this is also Aqua’s maximum capacity. Although not so spacious in size of 33m2, the apartment, in addition to the spacious hydro-massage bathtub, also offers a nice and tiny kitchen and a large and comfortable double bed. In addition to high-quality furnishings, this apartment is popular also because of its affordable price, compared to what it offers. There is no parking spot provided, however, the area in front of the building will provide plenty of free parking spots at all times. Our recommendation to all our future guests is, regardless of this list, to check out our huge database of apartments. We are certain you will be able to find the proper apartment which will suit your needs, wishes and possibilities and where you will spend unforgettable moments, while at the same time enjoying the charm and landmarks of Belgrade!